Tragedy drove Vitale Bramani to develop a sole capable of excellent traction on mixed surfaces back in 1935 using vulcanized rubber technology. In 2004 the Vibram brand launched the innovative FiveFingers "foot glove". Acting as a second skin, the FiveFingers design has revolutionised the barefoot shoes concept loved by walkers, runners and primal lifestyle enthusiasts alike. Furoshiki, the 'wrapping sole' launched in 2017 and has become Vibrams latest innocative and revolutionary footwear design. Browse our selection of Vibram shoes below and buy online today with 30-day returns and free UK delivery! Vibram Fivefinger, you will either love them or hate them! This exciting design from Vibram (the company that brought us the ultra durable rubber sole used in most branded footwear today) has been designed from the ground up to be dynamic and provide excellent performance in all terrain and sports. Invented in 1999 by Robert Fliri, and added to the Vibram range in 2005. 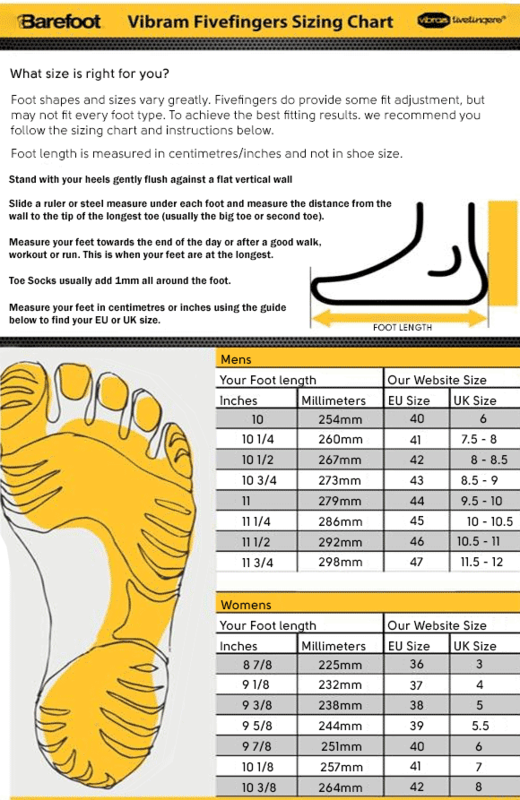 Do not let its simplistic design fool you, Fivefingers offer all the protection of a shoe with the feel of walking barefoot! They are flexible and discreet and easy to transport - be it on-foot or on your foot. Featuring a breathable but quick drying upper made from a thin abrasion resistant stretch polyamide and stretch mesh that wraps your entire foot. All outsoles are non-marking trek performance soles razor-siped for exceptional grip. Originally designed to help yacht racers maintain grip on slippery decks, the Vibram FiveFingers range has fast become a recognizable sport, trekking and travelling shoe. Vibram Furoshiki, wrap up and enjoy! Furoshiki (meaning 'bath spread') is a type of Japanese cloth traditionally used to transport items. Originally used exclusively for bundles of clothes whilst at the public baths to prevent mix-up of the bathers clothes. The art of Furoshiki became more widely used in Japan for transporting a number of items from gifts to wares. Vibram adopted the clever concept of Furoshiki wrapping and launched an innovative addition to there barefoot range. Furoshiki is the only vibram 5mm sole on the market that wraps around the entire foot. The upper is created using a non-restrictive stretch breathable fabric that fits anatomically around any foot type with a hook and loop closure. Being very lightweight, they can be rolled into a ball and carried around in your pocket, and even thrown in the washing machine for a quick and easy clean.